A study on the differences between injured first responders versus high or low physical demand workers in days off work, types of injury/illness, types of duty, and claim duration. 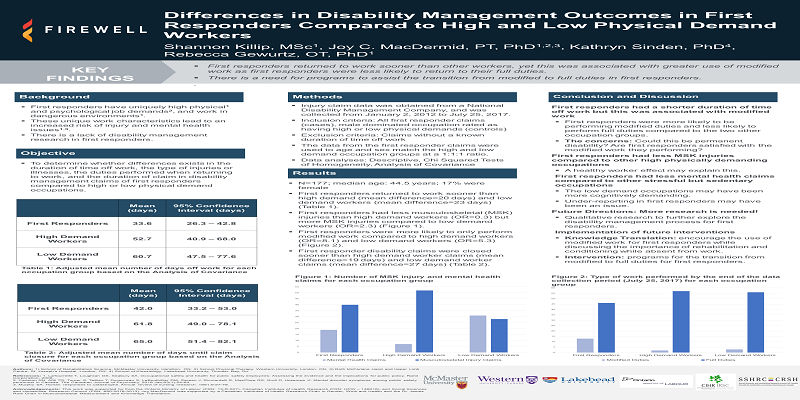 Killip S, MacDermid J, Sinden K, Gewurtz R. Differences in disability management outcomes in first responders compared to high and low physical demand workers [poster]. McMaster University Rehabilitation Science Graduate Programs Open House. Hamilton, Ontario. January 29, 2019. Check out some of our additional resources and videos that can be used to help you perform your job more safely!